Reduce, reuse, recycle – it’s a common phrase that we’re more than used to hearing. But, in the hectic hustle and bustle of the business world, remembering to separate your plastics from your paper might seem like a lot of faff. So, what if we told you that the small business benefits to recycling go way beyond simply feeling good about being green? Recycling will have a positive impact on both the environment and your finances. Reducing your company’s carbon footprint is a great way to improve your culture, too. According to the Waste Resources Action Programme, a quarter of England’s waste is produced by its businesses. Making recycling a responsibility that any business is socially obliged to acknowledge. First, the most obvious reason to recycle: it contributes to the protection of our environment, both by reducing the amount of waste going to landfill and cutting the carbon emissions usually caused by general waste disposal. Going green can improve your business’ reputation, showing clients, staff, investors and the general public that you’re mindful of your business’ impact on the planet. It can boost your staff’s morale, making them feel as though they’re a part of something positive. Plus, staff members who already recycle at home will appreciate the opportunity to do so at work too. Recycling saves money as well as the planet. Recycling isn’t expensive to organise, and it can cut both costs and your carbon footprint. But more on that later. The first step in setting up a recycling scheme for your office is to find an appropriate local recycling waste contractor – in other words, the service that will collect your recycling from your offices, or a recycling drop-off point, and deliver it to a recycling facility. The government provides a database of waste contractors across the UK – you can browse it here. It’s also a good idea to get in touch with your local authority to check out their recycling guidelines and see if they can recommend a service. To get going and start recycling today, you can also compare the cost of waste providers by simply filling in the form at the top of this page! The materials you’ll be recycling – is it authorised to handle them? Does it offer on-demand collection or do it in regular slots? How frequently can it collect from you? Can it collect waste directly from your office or will it need you to deliver it to a drop-off facility first? Can it cater for the size of your business and the amount of waste it produces? How will it charge you? Will it be annual or per collection? Does it hold a waste carriers’ licence (more about this below)? Once you’ve found a contractor that fits all of your preferences, you’ll need to negotiate a service contract with them – including collection schedules and the contract period. Many contractors will provide you with the necessary recycling bins to use in your office – it’s worth making sure that this is the case, or else finding somewhere to purchase them from. Often, a contractor will visit your office before the deal is struck in order to suss out the bins you’ll need, and the best location for you to leave them to be collected. What can a business recycle? Remember, only general waste can be disposed of in black bin bags – recycling must be disposed of in clear bags. Every business has a legal duty of care over its waste, and must ensure it’s stored and transported safely and securely, without causing any harm to people or the environment. When it comes to recycling, your business will be subject to a number of requirements under the duty of care law. Firstly, as with general waste collection, the contractor you select to transport your recycling to a recycling facility must hold a waste carriers license, having registered with the Environment Agency or – if you’re based in Scotland – the Scottish Environmental Protection Agency. This is your look out, so ask to see a copy of their certificate of registration before employing their services. Make sure you ask the contractor where they plan to send or deliver your recycling to, to ensure it’s being properly recycled. Conversely, if your business is going to transport its own recycling, make sure it delivers it to a licensed drop off facility (you don’t need to be registered as a waste carrier, but you must be sure you’re going to a site which is authorised to accept commercial recycling). Any recycling collections or drop-offs, whether carried out by a contractor or your business, must be accompanied by a waste transfer note (WTN), provided by the waste holder/producer (you) and filled in by both you and the contractor. If you have waste collected regularly, you can create a ‘season ticket’ to cover a series of loads. The UK government provides more detail, plus a waste transfer note template, here. Electrical waste needs to be recycled in compliance with WEE (Waste Electrical and Electronic Equipment) regulations. You can read up on those here. Can recycling save your business money? While you might assume recycling will be an additional cost to your business, you’re actually likely to find that it causes your overall waste management costs to drop. After all, if you end up recycling a large portion of your waste instead of simply sending it to landfill, you’re going to save on landfill tax – which has now risen to a considerable £84.40 per tonne – not to mention waste disposal gate fees, which sit at an average of £6 per tonne. Plus, whatever non-recyclable rubbish you have leftover after recycling isn’t likely to require a high-capacity service to remove it – and it probably won’t need to be collected as frequently, either – saving you money in waste collection costs. If you want your business’ recycling to have as much of a positive impact as possible, you and your staff will need to follow a few best practices. Of course, some of these will be difficult to monitor and enforce to your staff. But, you can make sure everyone is aware of the rules – and send out reminders if standards seem to be slipping. Firstly, you should be aware of whether you’ll need to separate all of your recyclable materials or whether you can mix them – for example, putting glass and plastic into the same bin. Check your local recycling guidelines, or those of the facility your contractor delivers to, to be sure. Regardless of this, you and your staff should always rinse out food packaging and drinks bottles before throwing them away. Recycling facilities simply cannot recycle plastic packaging that has food smudged into it – cleanliness is crucial! Likewise, you should only recycle clean paper. Ink and pencil markings are fine, of course, but if a piece of paper is grease-stained or has been used to wipe up food, it’s no longer recyclable and should go into general waste. For even more cost and ecological benefits, try to reduce the amount of waste your business creates in the first place. Encourage staff to ditch single-use plastics and avoid printing anything that can be read and shared electronically. You could even try supplying staff with branded reusable drinks bottles. Of course, you’ll also need to place general waste bins near these to negate the risk of people placing non-recyclables in the recycling bins. First, things first – you need to make your employees aware that you’re introducing a recycling scheme. Send the message out through internal communications (such as emails and newsletters), put an update on the company intranet (if you have one), and stick notices or posters up around the office. Do this before the scheme begins so that staff know there’ll be changes, and then again once it has started. Encourage staff to take part by explaining the benefits of recycling, and by being clear that everyone’s contributions are important. Make sure you keep your messages short and sweet, so your staff will have time to read and digest them within their busy schedules. It’s important that you use the communication channels your staff pay attention to – don’t only put your announcement in the newsletter if the majority of staff don’t regularly read it! You’ll also need to make sure that your cleaning staff are aware of the new recycling procedures. Setting up a recycling system in the workplace is one thing, but maintaining it is another. Most domestic plastics can be recycled without a problem. As long as they’ve been thoroughly washed, your empty milk container or old water bottle is fine to be recycled. 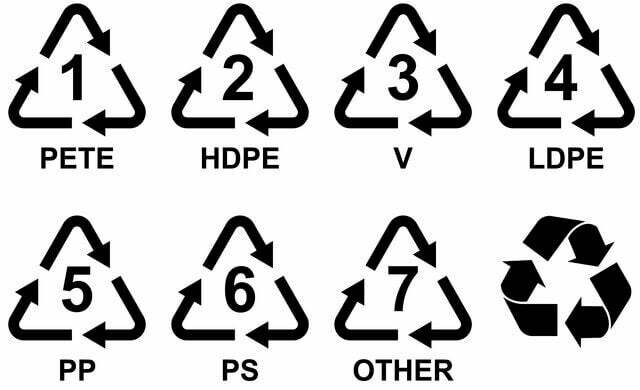 Confusingly, symbols 1 to 7 look like the recycling symbol, but instead of meaning that the material can be recycled, they identify the type of plastic the product is made from. Practically everything made with plastic should be marked with a code. Types 1 and 2 are widely accepted and are usually in container form, whereas type 4 is what plastic bags are made from, which is sometimes (but not always) accepted. Type 7 is a mixed plastic compound, like acrylic, and has little to no recycling value. It’s best to check which types of plastic your recycling agency accepts, and then clearly signpost this to your staff, so that you don’t mix the wrong plastics together. For more information on this, take a look at our page on plastic recycling. Glass is 100% recyclable, so you don’t need to worry about confusing symbols here. Just make sure that your jam jar is thoroughly washed out before you pop it in the recycling. But what about coloured glass? Mostly, you can recycle all glass bottles and jars in the same way, regardless of colour. This is known as single-stream recycling. However, some recycling companies will request that you separate your glass into clear, brown, green and blue glass. Again, check what your agency’s preferences are. Can the label on jars go into the recycling? Yes. The recycling programme will allow for labels, but some do ask that lids and rings are removed before recycling – again, check with your agency or council. Window glass, ceramics, light bulbs, ovenware and automotive glass cannot be recycled via domestic glass recycling, as such materials have to be treated differently due to their different melting temperature. So, how do you recycle light bulbs? Well, certain light bulbs – such as fluorescent tubes and CFLs (Compact Fluorescent Lights) – must be collected, or disposed of, separately to your usual recycling or rubbish. This is because they contain mercury, which could be dangerous if it leaks out of the bulb. Other than that, light bulbs cannot be recycled, unless the individual manufacturer runs a scheme. However, light bulbs that are not fluorescent can be disposed of with other domestic waste. 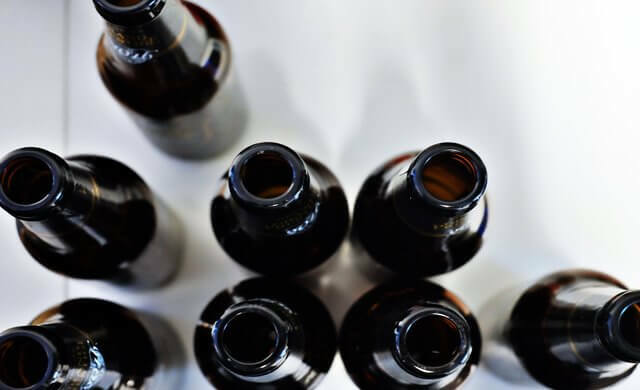 Take a look at the Startups page on the essential dos and don’ts of glass recycling for more information. The benefits of recycling your business waste are undeniable. If you’d like to get started, follow the advice in this guide, and get in touch with your local council for their advice on how to go about introducing a recycling scheme in your area. Or, to start recycling today, compare the cost of waste providers by filling in the free form at the top of this page!